The problem with this is the phone is running on JB. The 8gig will go down to 4-5 gig as a phone memory, in case you didn't know, galaxy with JB os cant transfer apps to SD card without rooting. Sammy needs to workout the partitioning system they made for their device. Or they may llok like simply luring their costumer into a trap. Samsung.. still the same design since the SIII... No innovation.. you make things bigger or smaller without changing the design.. you're becoming like apple frankly speaking.. how disappointing. Samsung out of ideas again? 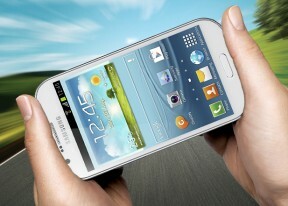 Same design too much look alike S3's on the market now. Guess they're lacking innovation. Have you forgotten your own review on the HTC One SV? Very similar specs and compareable results on the benchmarks. Samsung's mobile boss perhaps also does not know that how many galaxy devices are in market right now.